This is one of those too many possibilities Sundays. You will have to make choices. I have tried to include a little of everything. It is the Sunday before All Saints Day. If you celebrate All Saints Day on Sunday, go to Year A - All Saints Day for ideas for the Day and for the All Saints texts. There are also All Saints ideas based on this day’s texts in this post. It is Reformation Sunday in some branches of the Christian community. A few ideas related to that are included in this post. And, in the children’s lectionary it is the day before Halloween. The younger children are all about costumes in which they see themselves as other people (an obvious opportunity to push for seeing themselves as saints). Older children are gathering courage for scary stories and trips through haunted houses (maybe a connection to the courage to step into the dry Jordan River and enter the Promised Land). No matter what else is explored in worship remember children’s Halloween activities in the church’s prayers. Pray for safety for trick-or-treaters and those who dare to tour haunted houses. And, pray that everyone remembers that behind the costumes and masks, we are all God’s loving people and treat people accordingly. This lection omits the part of the story that is of most interest to children- carrying 12 rocks from the middle of the dried river bed to make a pile that children could ask their parents about in the years to come. So, I would add Joshua 4:1-7 to the reading (FYI it appears nowhere in the RCL). There are two ways to prepare worshipers to pay attention to the text. F Have 12 men carry one fairly big rock each down the aisle and pile them near the worship center. As they do, instruct worshipers to listen for 12 men doing the same thing in the reading. During the sermon recall other structures that have been erected to remind people of their shared stories, e.g. national monuments. Talk about the importance of knowing these stories. Encourage families (both the parents and the children) to tell and talk about faith stories (e.g. read Bible stories). F Introduce the Ark of the Covenant. Note that unlike Noah’s ark, the Ark of the Covenant is not a boat. Show a picture of the ark and explain how it was used. If you have the tablets from the Moses display (Moses Display Overview), show them, wonder where the people kept them as they moved around the wilderness. 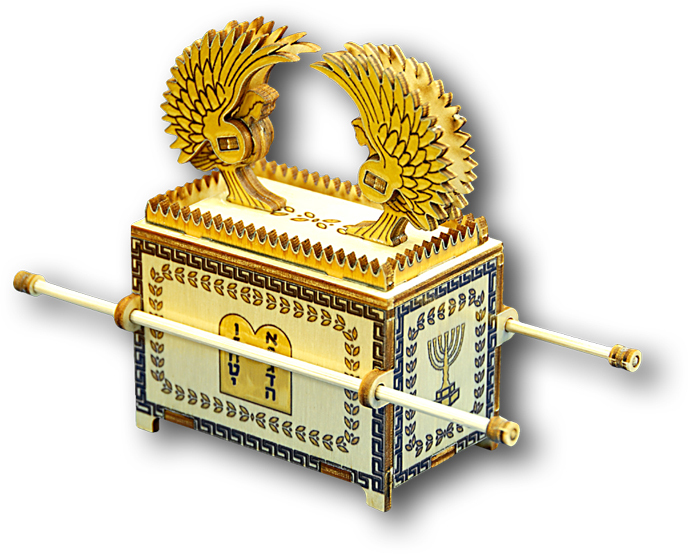 Put them in a golden box (wrap any box with gold wrapping paper) and tell about the Ark of the Covenant. Finally, encourage worshipers to listen for the ark in the reading. F On the day before Halloween, this story tells of two acts of bravery that every single man, woman and child had to do – they had to walk across the dried up Jordan River and they had to leave the wilderness where they had lived all their lives to enter the Promised Land. They had heard and loved the story about their grandparents walking through the divided sea to leave Egypt. But, now they had to do the pretty much the same thing. It is like walking into a haunted house or graduating into a new school. You have heard other people have done it, but now it is your turn – and it is scary. It is also like moving today. 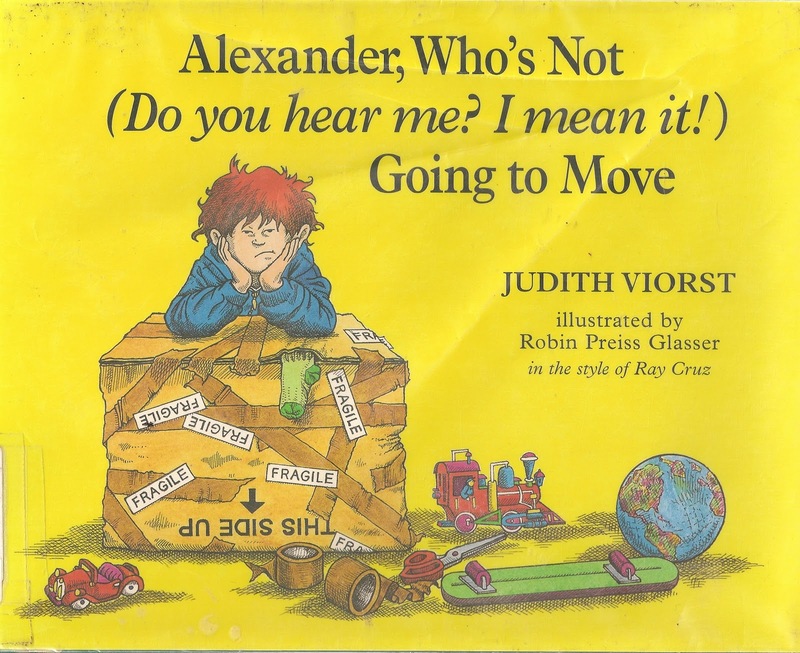 Check out Alexander Who's Not (Do You Hear Me? I Mean It!) 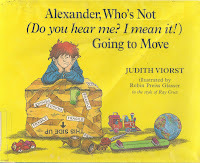 Going to Move, by Judith Viorst, for a light-hearted but honest look at the feelings of a child who does NOT want to move. (Yes, the same Alexander as in Alexander and the Terrible, Horrible, No Good, Very Bad Day.) Rather than read the entire book, you might just read the first page and show the picture on it. I imagine there were some children feeling the same way on the edge of the Jordan. F One BIG problem! The list of the names of all the people who were to be driven out of their homes immediately reminds adults of today’s Palestinians. Children may miss this entirely. Or, if they are caught by the list of unusual names, older children may wonder who they were. Those who tend to root for the underdog may ask what happened to those people and question whether it was fair of God to give their homes to other people. Unless you see an easy answer to this, I’d avoid getting in conversations with children (especially in front of the congregation) in which the question could be raised. Psalm 107 is a road song. Pilgrims climbing the steep, hot road up to Jerusalem to worship at the Temple, would recite it as they walked in groups, rather like some of the songs families sing in cars as they travel today (think “Banana-nana-bo bana”). It has a clear pattern of verses describing the trouble some people faced and were saved from by God and a chorus calling on them to “thank the Lord” for their deliverance. Today’s lection cuts across the pattern. Just for fun and to connect to the Joshua story, I’d stick with the pattern and read verses 1-9 instead. They can be put into a congregational reading as below. Before reading it, tell worshipers to imagine themselves in a crowd singing on the hot, steep road to Jerusalem. For maximum effect have the whole congregation stand and walk in place as they read the psalm together. And so, because of you, Zion will be ploughed like a field, Jerusalem will become a pile of ruins, and the Temple hill will become a forest. F If you frequently use the traditional prayer of confession below, pray it today. Before praying it point out the highlighted lines and briefly suggest that we need to pray them in all parts of our lives – families, school, businesses, government, etc. O Lord, have mercy up on us. This cry for vindication goes over the head of most children. I’d either use the other psalm or let this one be for the adults. Click on Saints and Their Source for an article that pulled these texts together in such a helpful way for me that I find all my suggestions grow from it. The authors insist that saints are people tied to God’s word and that God’s word (1) comes from God (2) through others, and (3) works in the us. Read the article to get their full meaning. F To introduce the idea of saints to the children display the artwork, “Gathering of the Spirits” by Jan Richardson (click on Jan Richardson Images). This is non- literal art and will challenge children. Some “I wonder” questions will help. I wonder what that round thing is? the sun? the moon? the light of God? I wonder who the gold things are? Can anyone guess what the square things are? This should get to a discussion about all the people/saints who we are always aware of, who show us about God by just being there, and who help us live well. F In his letter to the folks at Thessalonica, Paul is recalling his ministry with them. If you did not do so last week, tell stories of previous pastors in your congregation to explore how God worked in them and the people in the congregation at that time. If you have photographs or paintings of past pastors that are usually hung in public spots, bring them to the sanctuary. Ask who knew, was baptized by or married by the more recent ones. Then move on to points about God’s word working in relationships in churches. Children may miss some of your points, but they will be more connected to pictures they hardly noticed before – and even add some of those people to their personal community of saints. 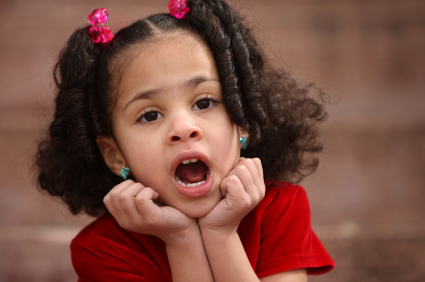 F Maybe even more than adults, children are urged to be the best, the most, the winner. Jesus’ call to servant living flies in the face of all this pressure to succeed. Acknowledge that openly. Explore the differences in the coach who wants the team to be number one no matter what and the coach who wants every member of the team to learn and grow in the game and for the whole team to have a good time playing together. What is practice like with each one? What about games? Which coach would you rather play for? In the part about Joshua, the account of the stones 4:1-7 is not in the RCL, it is in the NRSV. You are so correct about that. Thanks for the heads up for all of us. I'll correct it for those who are yet to check in. Always learning! I'm a Presbyterian. I know about Reformation Sunday, but had never tumbled to the possibility of a separate set of readings for that day. Thanks to you, Nathan, I found them on textweek.com. Maybe next year I'll do a post on those texts - and start with your ideas. I bet Martin Luther would have liked The Runaway Bunny - at least later in his life!